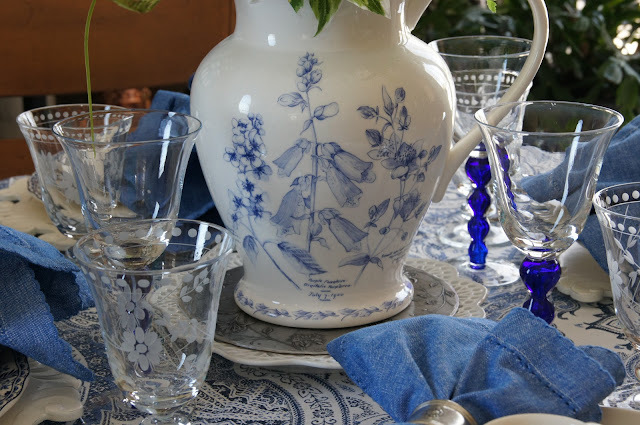 Home and Gardening With Liz: Springing It Up With The Blues! Still turning up the blues here! If you've seen my previous post you'll know what I'm talking about. 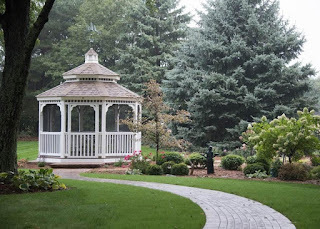 To start with let's pretend we're outside dining in this gazebo. If I had one this would be my style! Time for a ladies luncheon! As you can see I loaded up the table with plenty of blues! Seeing some of my blogging friends in the south posting their beautiful spring weather I just had to pretend I'm outside like they are! Spring is still playing games with us. 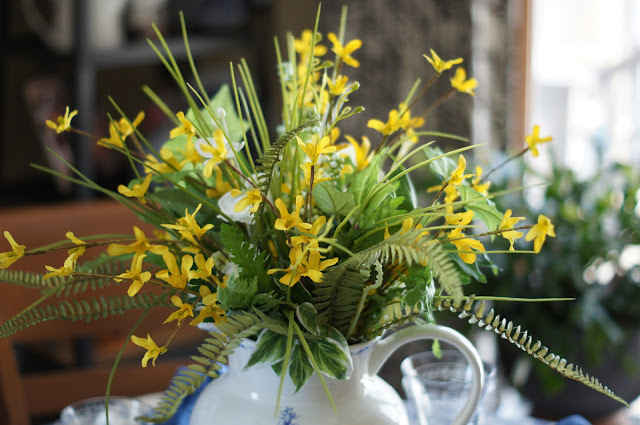 We are melting down again after the post-Easter snow we received so I'm still inside springing things up! I made up this arrangement with silk plants I had on hand. While in Pennsylvania I saw forsythia and daffodils blooming so I had to use some yellow for a pop of color! I bought the forsythia branches at Hobby Lobby a while back- they are so realistic looking! While visiting our daughter in-law's Italian family in PA they all had some espresso after dinner. I ordered these cups one year with the dishes and silly me didn't realize I had ordered espresso cups! I decided this would be a nice time to try them out. Sweetener and creamer a must for the espresso! I like the casual floral design this offers. It mixed well with the tablecloth and the salad plates. This is the fun part about mixing patterns! With all the blue patterns going on I needed the white chargers to create a visual separation. 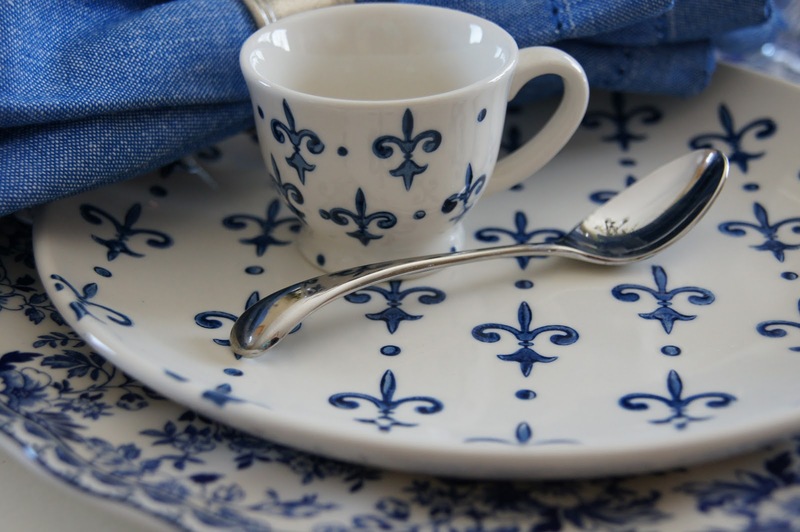 Fleur De Lis is a favorite design of mine. Cobalt blue and floral etched stemware to compliment the centerpiece. 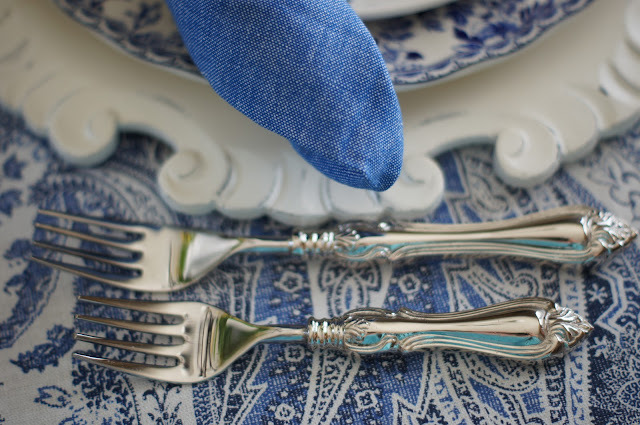 Chambray blue and shiny silverware make good pairings. I layered a reticulated white plate with a metal trivet to act as a base. 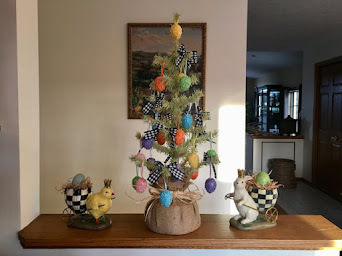 I gained a little height for the centerpiece and it gave it better definition. I kept the attached card when I bought this "jug". It's made by Queens out of The Garden series by an English artist- Lilian Snelling 1879-1972). 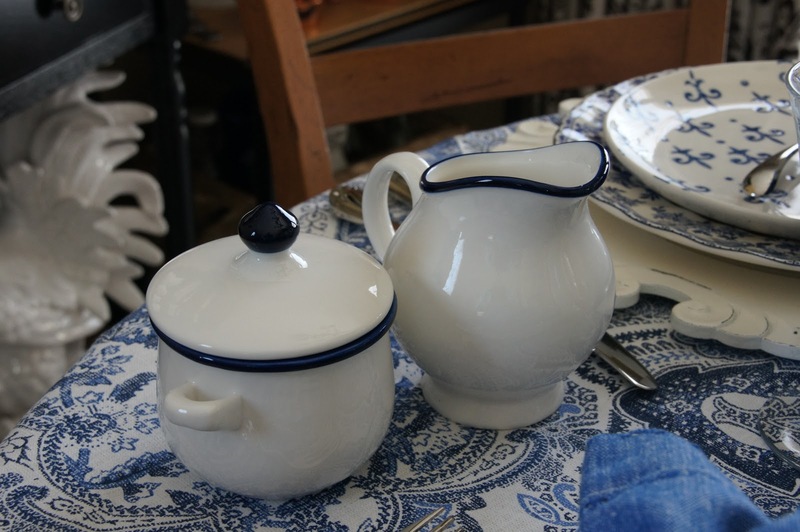 They transformed some of her colorful designs into blue and white. I found these at T.J. Maxx 6 years ago. I have a much smaller version of it too. Gorgeous. 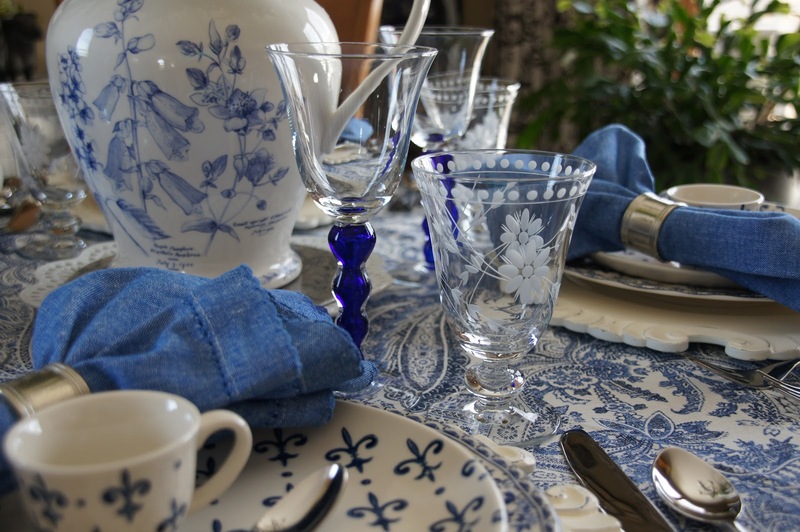 Such a beautiful collection of blue dishes and accessories. 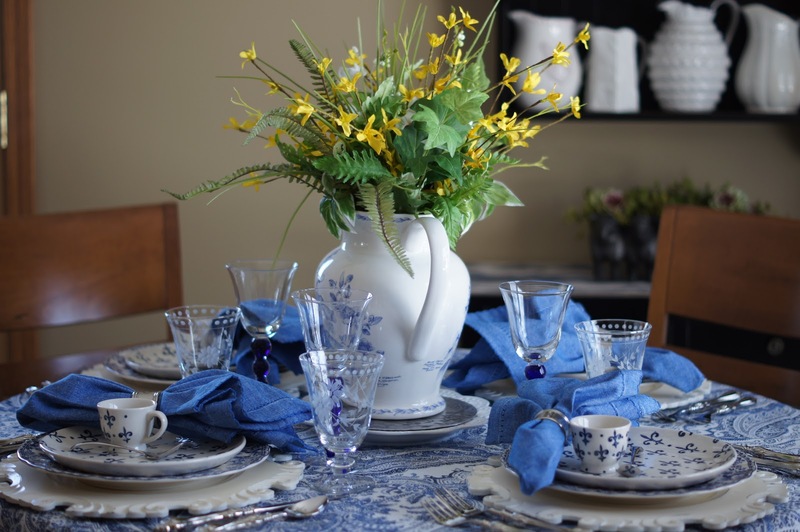 Stunning and inviting tablesetting. What a beautiful table! I'm a fan of blue and white, and this table hits all the buttons for me. 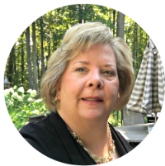 hi Liz! Your table of blues is just gorgeous! 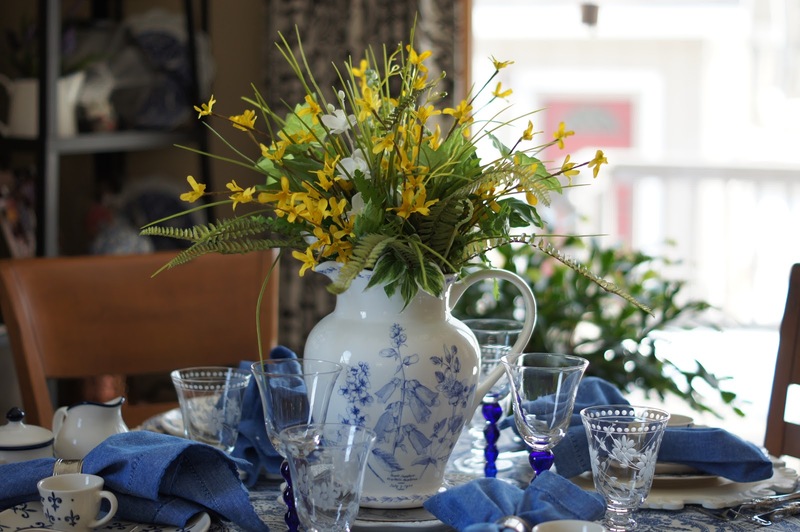 Nothing says spring better than forsythia in my book and it's lovely paired with blue...YES, I would love a gazebo like that too! I could sit at a table of blues every day! Love your fleur-de-lis plates -- stylized lilies are perfect for spring. In fact I love everything about your table. You have quite the knack for combining patterns. Here's wishing our warm spring weather heads your way soon. It's all beautiful Liz. 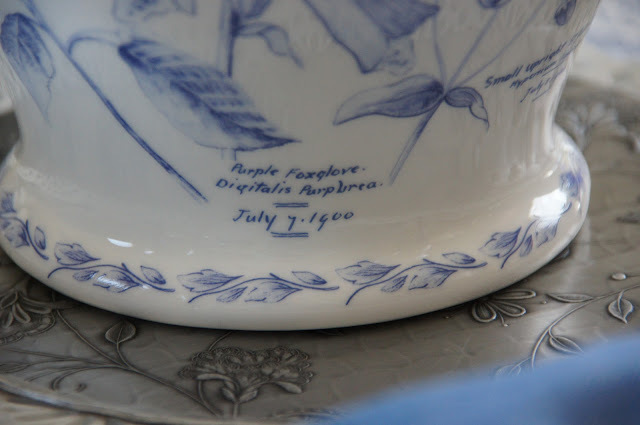 I love the flowers painted on the pitcher. Gorgeous. 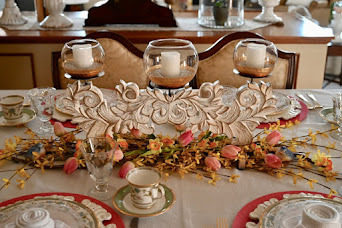 Another beautiful table setting. 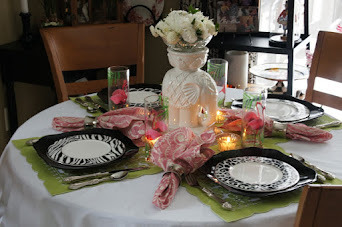 Oh my goodness Liz...this has got to be one of my favorite tablescapes....gorgeous! The patterns and color are so very well curated for a most beautiful look! What a great find in that pitcher!! 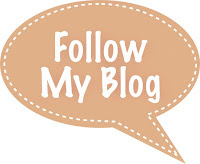 O MY!! 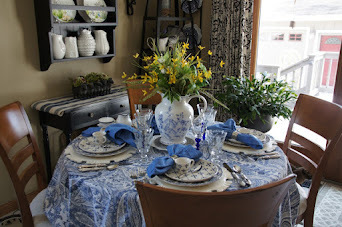 Love your blue tablescape!!! Liz, this table is gorgeous. I love your blue collection. So pretty and traditional. 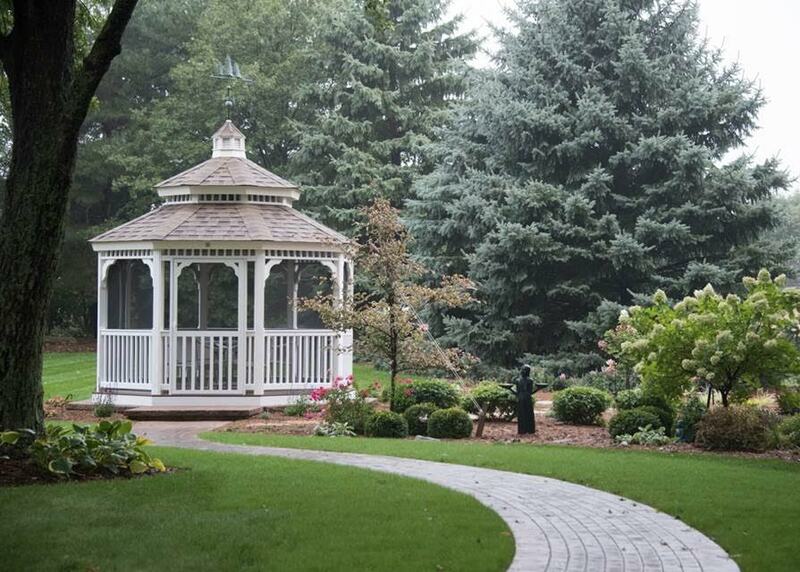 The gazebo is charming. It would look great in your yard. The pitcher is so pretty Happy anniversary you you and Dan. I am featuring your living room this Sunday. 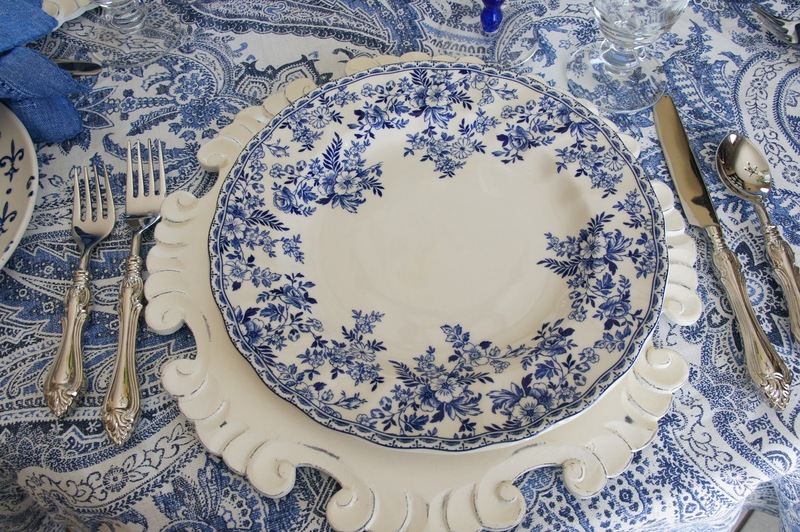 Liz, I’m a true fan of blue and white! Looks perfect! Liz, your table is so beautiful. 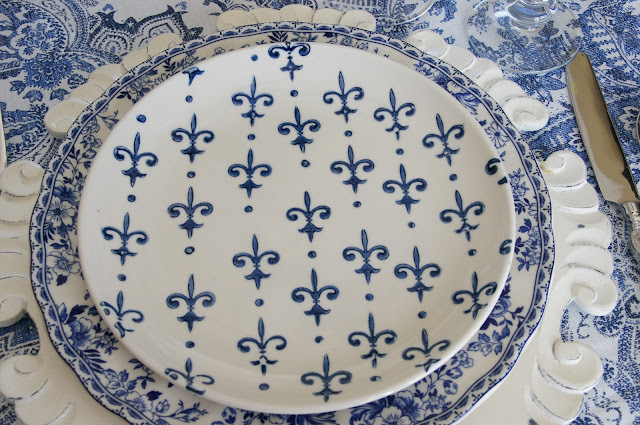 I absolutely love those dinner plates!!! 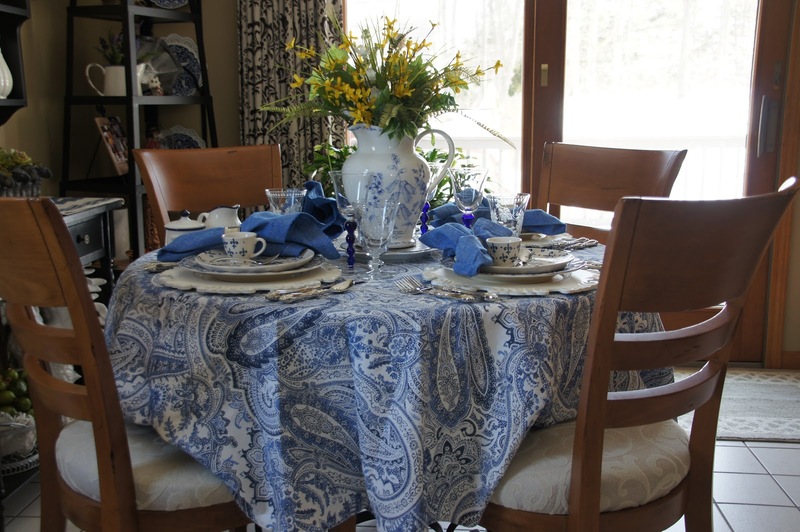 The paisley table cloth looks fabulous with your plate combinations and the pitcher puts it all over the top! 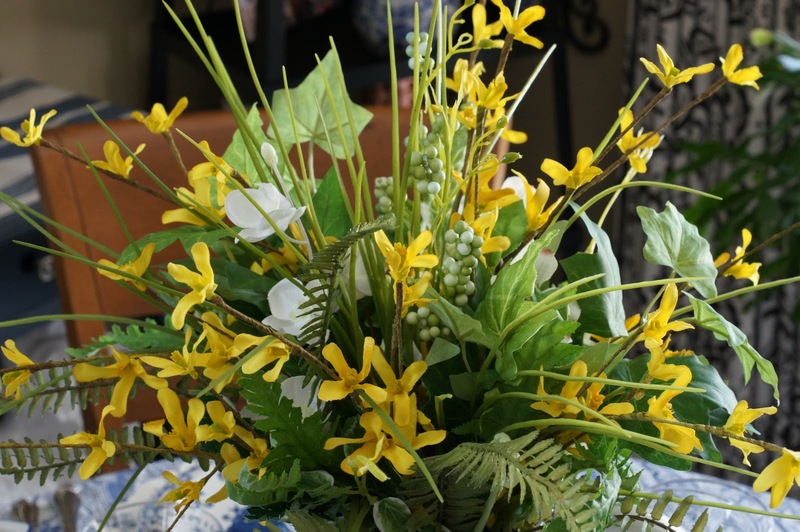 Love the flower arrangement you did. 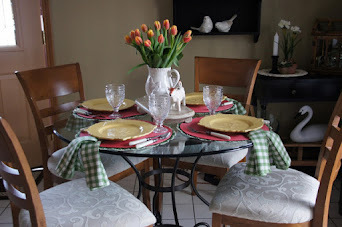 I can pretend with you and see this table looking spectacular in your gazebo!! Liz, I am swooning over this blue and white table. 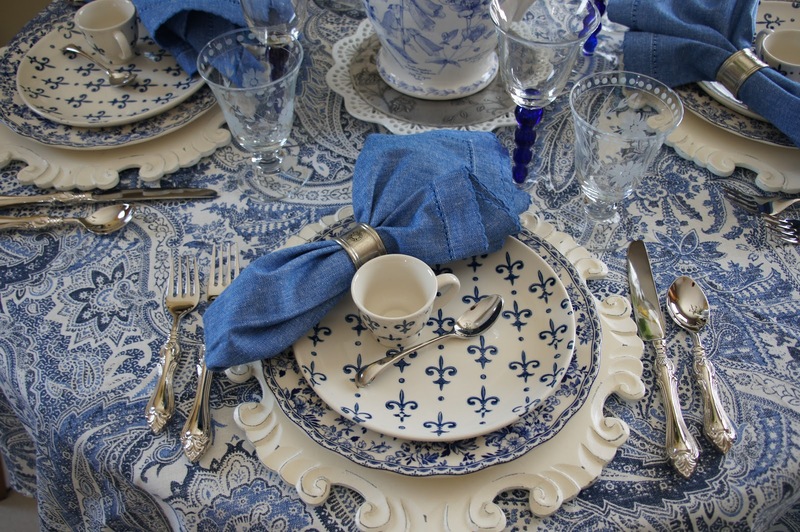 The plate stack and the table linens are gorgeous. Psst, I have a couple of the same espresso cups, and I love the fleur de lis. 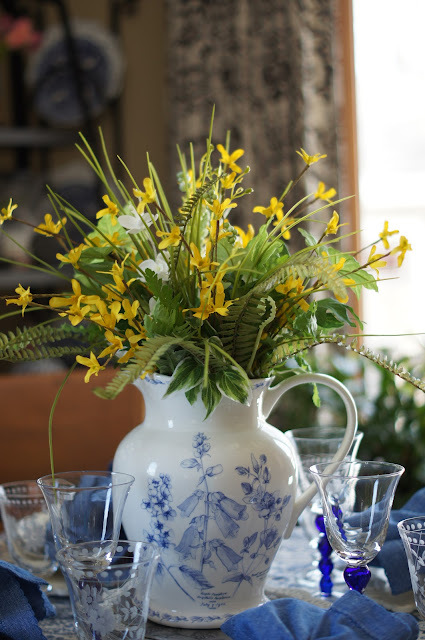 The center piece that you made with all of its yellow plays perfectly against the blue and white. I love the pitcher! You would not know that spring hasn’t arrived, you have spring inside to enjoy! Liz, love all your blues!!! !